There is something empowering about doing your first pull-up. The feeling of struggling and ever so slowly inching your chin up and over the bar is awesome! My client Jenny recently conquered her first pull-up. I vividly remember her watching another woman perform effortless pull-ups next to her. 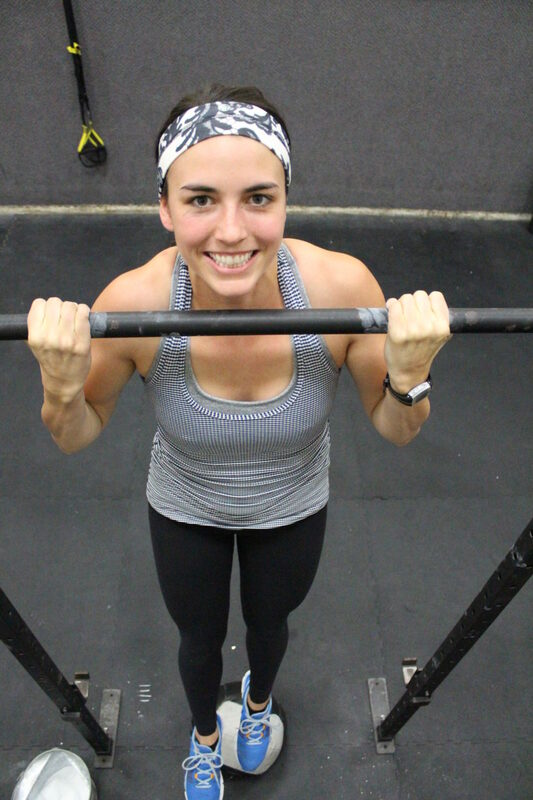 Just because she couldn’t do a pull-up in 7th grade gym class does not mean she’ll never get her chin over the bar. Fast forward one year. Jenny is now able to do 3 unassisted pull-ups on her own! Below I lay out the steps I used with Jenny and many other women to get to their first pull-up. *Bonus* You also get to see rare footage of baby Matt and Nicole three years ago when we were filming our first videos for online personal training! Master the lat pulldown before progressing to any type of pull-up exercise. The lats, shoulder stabilizers and core need to be strong before you are pulling yourself up against gravity. If these muscles are weak, doing a pull-up is nearly impossible. At best, you’ll do one with poor form at best. Spend at least 4 and up to 8 weeks performing the lat pulldown at least 2 times per week before progressing. Add plank holds into this phase. This will allow you to strengthen the core and shoulder stabilizers. These two exercises teach you how to keep the body in proper alignment, strengthen the core, and develop grip strength. Spend 4 to 6 weeks in this phase. Perform hollow body rocks at least once a week and work each week on increasing time. Perform hanging leg raises at least once a week and work each week on increasing reps and make sure you don’t swing excessively. Add farmer’s carries into phase 2. These will help with strengthening the grip as well as working on posture and core strength. This exercise is great for learning the pull-up movement. But, don’t stick with this one for too long. Once you stop progressing, move to the 4th phase. This phase will take 4 to 6 weeks. Perform this exercise 2 times each week. When doing this exercise, be sure to keep the glutes and abs engaged. Do not swing your hips and use momentum. Each rep should start from a dead-hang. Add the Inverted Rows into phase 3. These will help your body get used to pulling against gravity. Perform this exercise 1 to 2 times each week. Don’t be intimidated. The resistance band won’t bite (unless you let it slip from under your foot). Find a partner to help put the band on (preferably someone you trust ;)). Start with a thick band. Every few weeks, try a thinner band. Before you know it, you’ll be band-less! Expert tip: A chin-up (palms facing you) tends to be easier than a pull-up (palms facing away from you). Spend 8 to 16 weeks in this phase. Perform band assisted chin-ups 2 times per week. Start with chin-ups and then half way through, try flipping your grip and doing pull-ups. This exercise will get you to the point where you can perform a Chin-up. Do these 2 days a week for 4 to 8 weeks. Add plank high to low to this phase. This will help with keeping your body stable while doing a pull-up. Hey, you made it. [virtual fist bump]. I’m proud of you. Once you can do one chin-up, post the obligatory Instagram video. I would still work on eccentric pull-ups and chin-ups in this phase as well. Spend 6 to 8 weeks in this phase. Perform chin-ups 2 to 3 times each week. Once you are able to do 3 to 5 strict dead-hang cull-ups, give the pull-up a shot. Add the stability ball layout pike into this phase. It’s brutal. You made it! Mastering a pull-up is a HUGE accomplishment. It takes hard work and a lot of practice to get there. When you do, it’s empowering. Don’t let your middle school days define your pull-up skills. If you put your mind to it, you can do it! this is rad. I have always wanted to do a pull up and only gotten as far as some sorry assisted pull ups- thank you for the step by step! Okay! Ryan does pull ups every night… and I guess I’ll have to join him! I think you will, deb. One of the best ways I’ve found to get good at any exercise is by doing it often. I’ve found 3 sets of 3 to 5 pull-ups 3 to 4 days per week is the optimal formula for getting to 10 or more! Excellent! I will try this up here in Vallejo! Thanks Matt.